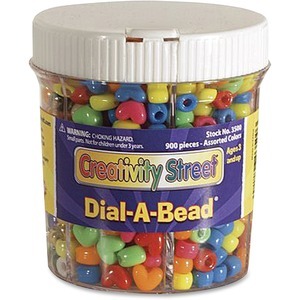 Pour out just the beads you want with the Dial-A Bead assortment. Unique shaker-top jar contains 900 beads in six different styles each in its own compartment. The jar is easy to use. Simply twist the top and shake out the bead style you want for your craft. Beads are designed for children in preschool to third-grade and ages 3 and up.